Search engines consider site speed to be an important factor search rankings. This is why at WPBeginner we try our best to improve site load speed to an optimal level. Doing that, we have noticed that caching our website helped us improve site speed as well as balancing huge spikes in traffic. We use W3 Total Cache to improve performance of our website. However, many of our readers asked us about how to install and setup WP Super Cache. Therefore in this guide, we will show you how to install and properly setup WP Super Cache. Note: Both W3 Total Cache and WP Super Cache are great plugins. We highly recommend that you use one or the other depending on your needs. First thing you need to do is install and activate WP Super Cache plugin (tutorial: how to install a WordPress plugin). Upon activation, WP Super Cache will notify you that caching is not enabled on your website at the moment. After turning on the cache, click on the test cache button to check if it is working. WP Super Cache will fetch your WordPress site twice and will compare the time stamps of both pages. If the both time stamps match then this means that caching is working on your site now. WP super cache is a powerful plugin, and it comes with many advance options. These options can further improve your site’s performance. To Set up WP Super Cache with advance options, go to Settings » WP Super Cache and click on Advanced tab. First check the box that says Cache hits to this website for quick access. Below that you will see three caching options. By default WP Super Cache uses PHP to serve cache files. However, using PHP to serve cache files can be resource intensive particularly on shared hosting environments. So we would like to recommend that you try using mod_rewrite to serve cache files. After that scroll down and hit the update status button to save these settings. WP Super Cache will now show you a notification that mod_rewrite rules must be updated and possibly another notification about scheduling garbage collection. Scroll down the page, and you will see mod_rewrite rules that needs to be added. Click on Update Mod_Rewrite Rules button to update these rules. Once mod_rewrite rules are updated this section will turn green. Enable Compression in WP Super Cache: Compression allows WP Super Cache to serve cached files as compressed files. These files are downloaded by user browsers quickly due to their smaller size. To enable compression, simply check the box that says Compress pages so they’re served more quickly to visitors. At WPBeginner we use MaxCDN. You can read our blueprint on Why we use MaxCDN. If you need help setting up MaxCDN, then we already have a tutorial for how to install and setup MaxCDN for WordPress. The tutorial uses W3 Total cache, but the basic concept is the same. Lastly, check the box that says Skip https URLs to avoid “mixed content” errors and save changes. Now your website is now ready to serve static content from a CDN. The preload mode in WP Super Cache allows you to create super cache static files for all your posts and pages and serve a static website. You may ask Why would anyone want to do that? To serve an old site that is not being updated anymore. To improve site speed by serving static content only. These were just a few reasons but there could be many more reasons and situations where you might want to completely disable PHP processes. Don’t worry your WordPress will work normally, and you will still be able to manage your content with WordPress. Refresh preload cache files options will be set to zero by default, minimum required time is at least 30 minutes. Pre-loading your entire WordPress site takes some time and consumes a lot of resources on your server. You can leave it to 0 if you do not want your static files to expire ever unless you manually refresh cache. We hope this guide helped you setup WP Super Cache on your WordPress blog. For plugin specific support, please post all your questions in the WordPress support forums for the plugin author. Read our guide on how to properly ask for WordPress support and get it. For other feedback and questions, please leave a comment below. A custom url or permalink structure is required for this plugin to work correctly. Please go to the Permalinks Options Page to configure your permalinks. Thank you for reminding us of that, we’ll be sure to look into updating the article for clarification. Thank you for all your work, I’m a complete newbie and without you, I don’t know how I’d manage. I’m confused as regards what off-site URLs and CNames are, so I’m unable to fill in that in the form. Do I have to refer to somewhere on my page to find out or do I just create it my indicating something? Just in case it affects somehow I’d like to inform that I run a multisite. The off site URL is the URL of your CDN location and CNames are different pullzones you have created on your CDN server. 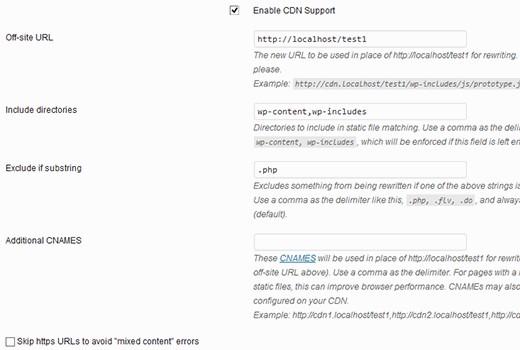 If you are not using a CDN, then you don’t need to make any changes to these settings. can i use this plugin for testing in localhost ?? is it because i can’t use cache plugin in localhost or some other issue ? There is nothing called MOD_REWRITE. Everything from that step seems completely different. Please update the tutorial. No matter what settings I use Pingdom still gives me an F and says “The following cacheable resources have a short freshness lifetime. Specify an expiration at least one week in the future for the following resources:” and I see and “expiration not specified” message in the details. Am I missing a setting? Thanks for the amazing article . I have installed WP Super Cache with cloudflare (newbie blogger). Can you please help me, how can I integrate cloudflare with WP super cache . I did not found any articles or vidoes for the same . Hi, I wanted to speed up my site. I used this guide and customized the settings as you shown. But before installing this plugin I tested my site speed it was 4.20 sec. But after installing I check it was 6.78 sec. Why is it like this? please guide me well. Please test it again. If the result persists, then deactivate the plugin. hello sir, I’m trying to integrate js and CSS code elements in twenty-seventeen WordPress theme. I use enqueue methods but it does not work, so suggest me to all about. 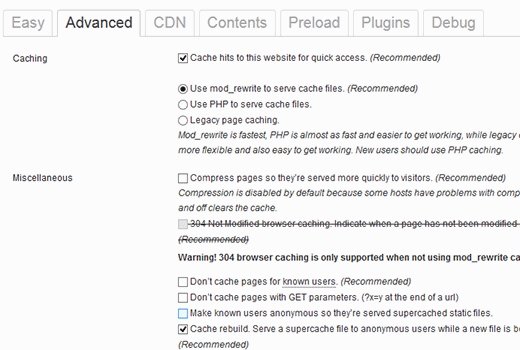 I just downloaded WP Super Cache and the “Advanced” Page doesn’t have the same setup (or some of the same options!) as your screenshot and instructions. Are those dates, or did I somehow end up with an older version of the plugin? Same here, my settings are different. Hi guys – Thanks for sharing this. I am using wp super cache and my wordpress is 4.0.1. At first, i don’t have any problem. Until recently, having a problem. My post did not appear on my website. I tried to put the caching off and my post appear. After that, I put the caching on again. My workaround was after posting article to my website, I will put my caching off to appear the post in my website, then after a few minutes, I will put the caching to on. Few weeks doing that, and now, when I put the caching on, my post will disappear again to my website. As of now, my caching is still off. Thanks and hope you can help me. Seems like WP Super Cache is not clearing the cache when you publish new content. 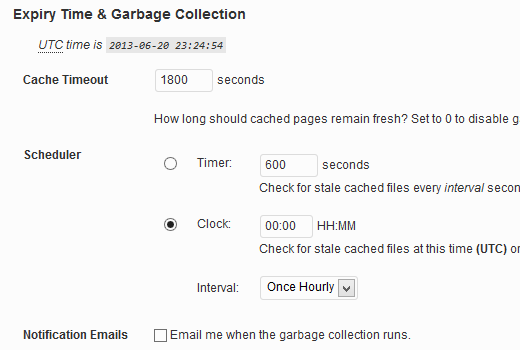 Please see our article on how to clear cache in WordPress. Thank You for your help with this issue while trying to install WP Super Cache. Warning! Could not update /var/www/website/wp-config.php! WPCACHEHOME must be set in config file. Warning! /var/www/website/wp-content/advanced-cache.php does not exist or cannot be updated. 1. If it already exists, please delete the file first. 1. Open /var/www/website/wp-content/plugins/wp-super-cache/advanced-cache.php$wp_cache_file in a text editor. 3. Save the file and copy it to /var/www/website/wp-content/advanced-cache.php and refresh this page. Cannot continue… fix previous problems and retry. Already use your Envira Gallery and WP Forms and those are fantastic. Should I just use W3 Total Cache instead? Initially my website was loading for under 8 seconds which is pretty bad. But using your tutorial I was able get 90/100 for desktop performance. But the mobile platform it remained 74/100. Could you suggest some resources where I could look up too or what is your suggestion. Hi, I’d like to know whether your guidance to choose mod_rewrite to serve cache files still stands as opposed to using PHP or Legacy Caching. I notice since you published your article, WP Super Cache have changed their own recommendation from mod_rewrite to PHP. Hi there. I’ve followed this tutorial to a T, and for the most part, everything works correctly, but I’m having two problems. First, when I make changes, they don’t appear on the site if I’m logged in. If I log out, they appear just fine. Second, I’m working on a WPMU network, and I only have the plugin installed on one site. But it’s caching the other sites on the network as well. How do I stop it from doing that? Thanks! This is an awesome guideline for new users. Thanks from the core of heart. So, I guess I’m wondering if there’s a laymen’s guide to literally all the terms you use cause I don’t understand websites or programming and I have a website for a start-up NGO so can’t really pay for any help at this point. Or maybe you could direct me somewhere that will help me understand all this better? I’m a complete novice and confused easily! I have a “conceptual doubt” about WP Super Cache, that I didn´t see answered neither in your site neither in other sites. The question is: the structure of my site is finished. In basic terms, it is mainly a site of videos of football, which means that from this day on I will gradually add posts (that include the videos that I refered) and pages (of the teams). Since that this will be a long and permanent process, I need right now to speed up my site because nowadays is very slow. My doubt is: when I install and configue this plugin, what does that mean in terms of the updates that I will do in my site (post and pages that I add)? I mean, if I cache the site today and tomorrow I add a new page or post, what do I have to do in order that these pages or posts will be also cached? – do I just have to require an update of the plugin? If so, how do I do that, is it possible to define that the plugin will update the cache for example once a week? If i don„t use set up the CDN ,the wp super cache will be work properly ? Yes, it will work even without CDN. I would be glad if you could help me out. Thank you so much, It works great for me. My site is a coupon site, so code is included on the coupon so it prints out by itself without lots of other junk that is on the page. If I use WP Super Cache, will that code be lost because it’s now a static page? Will people still be able to click on the coupon to print just the coupon? You will have to test it out first on your computer or in a staging environment. How to preload for several languages, I am using qtranslate, that seems impossible, right? This is an ecommerce site using Exchange from iThemes. With WP Super Cache activated certain pages that need to be refreshed don’t get refreshed i.e. Empty Cart. When you Empty Cart it comes back with the same content or in other words it appears unemptied. When I deactivate WP Super Cache the problem disappears. It was suggested that I Whitelist the pages that shouldn’t be cached. I am uncertain about how to do that. Any help would be appreciated. WP Beginner Staff, when a theme update is applied, or when other plugin updates are made, is WP Super Cache alerted to create new cached versions? Or does the plugin wait until “Expiry Time & Garbage Collection” or a manual cache deletion? I am using WP Super Cache, but it seems that my images don’t get cached. Any ideas on how to configure this? If you dont want to publish is comment because i include my site link PLEASE reply to my email id. Seems like you have already resolved the issue. please guide me ,i have been tried to solve this problem since last 2 days , please guide me . Also, Now how can I know whether it is working perfectly or not? How to Install and Setup WP Super Cache with CloudFlare CDN? A difference between the rules in your .htaccess file and the plugin rewrite rules has been found. This could be simple whitespace differences but you should compare the rules in the file with those below as soon as possible. Click the ’Update Mod_Rewrite Rules’ button to update the rules. This article was very helpful, and I was able to troubleshoot my issues based on your suggested settings. Thank you for the info! Thank you for your suggestions, I’m trying to apply these settings on my website now. Can you please advise if wp super cache supports minify settings. I had wp3 total cache and had a score of 97/81 on gtmetrix, after installing wp super cache my score decreased to 82/68. Was looking for some great guide for super cache plugin. Now I will try it on my test site. How do I get it to work for Mobile without changing the theme? Any info for Rejected User Agents list from the plugin ? Installed it and got a lower grade E/D on Gtmetrix…switched to W3TC and it gave me and A/B grade. i have a little question , when using this plugin to cashe pages , the google adsense ads will be cashed too ? ,it will show the same ads ? No your Google Ads will not be cached. Hi, Thank you for this outstandly good article. However, I am facing several issues with WP S. Cache. 1°) My Home page is a static one. However, when a new article is published, the /home must be changed (new article in the slider and so on). However, it is no the case! Moreover, when I just “update” this static page, by a strange miracle (not so strange because with the update, the cache-page is flushed), the /home becomes “normal”. 2°) From 1°), I decided to tick the Pages, Front page, Is_home in the rejected ones. However no changes appeared in the /home. Do you have an idea where could be the problem ? I’m sorry for my poor English language. I use now WP Total Cache, CDN is Cloudflare, shared hosting. Specialists working at hosting company I recommend using wp super cache to replace the WPTotal Cache. What is your opinion? WP Total Cache internet is recommended, considered superior WP Super Cache. I use Google translate for this comment. Is OK? Farcas, W3 Total Cache and WP Super Cache are both good plugins. Warning! Could not update /home/d2c45a95/public_html/wp-config.php! WPCACHEHOME must be set in config file. Warning! /home/d2c45a95/public_html/wp-content/advanced-cache.php does not exist or cannot be updated. 1. If it already exists please delete the file first. 1. Open /home/d2c45a95/public_html/wp-content/plugins/wp-super-cache/advanced-cache.php$wp_cache_file in a text editor. 3. Save the file and copy it to /home/d2c45a95/public_html/wp-content/advanced-cache.php and refresh this page. I have Super Cache working…the contents show all of the pages in the cache. It has increased our site speed. For some reason, when I enter additional cnames and use http://content1.insuringincome.com,…. Comma separated from content1-content10 (confirmed that all cnames are created in CloudFront districution)….I get a 404 error when saving. I have tried many different settings…nothing prevents the 404 from trying to save with additional cnames. Please checkout WP Super Cache documentation on how to set this up. First sorry my English, because it is not very good! I use wordpress and Boozurk theme version 2.02. I have a little problem and i want little help! The problem is: when i use my phone and surfing my site, sometimes the theme not switch to mobile view and everything in my site is with wrong view. I also use WP super cashe plugin. When i activate the cashe and continue surf the site, then the theme not switch to mobile view and show me a desktop view of the site. When i deactivate WP super cashe plugin and delete the cashe the view of the site on my phone is perfect. The theme switch to mobile view. to surf mobile view of the site, not the cashe page of desktop view. I hope you will understand me! Thank you! Borislav, it seems that your theme uses php to detect mobile users and then switches the theme. When you are using WP Super Cache, it displays the standard theme from the cache, so the part where your theme detects and displays mobile theme is not executed. 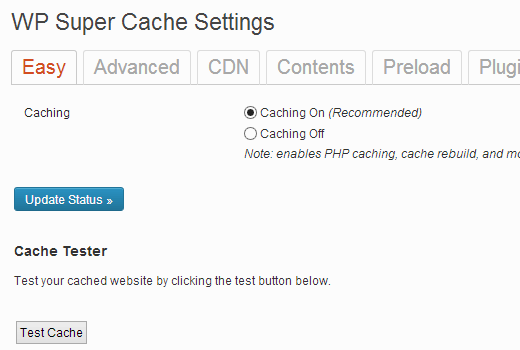 Your theme’s developer can help you better in this regard, or you can also try WP Super Cache’s support tab. Really useful, thanks! We managed to get one of our website’s loading time down from 6+ seconds to 0.8 using a combination of WP super Cache and Cloudlfare’s Rocketloader. Amazing! I wanted to use mod-rewrite for a website that has WordPress installed in a subdirectory. This seemed to cause a problem (only homepage was showing). What kind of thing is best to do in this case? Is there a way to use mod_rewrite on a sub directory? There could be various reasons. There could be a conflict with .htaccess file in the parent directory or a comment missing # sign in your .htaccess file. You better post in plugin’s page under support tab.